Could we create a real-life superhero by changing human biology itself? The form and function of the human body, once entirely delimited by nature, are now fluid concepts thanks to recent advances in biomedical science and engineering. Professor, author, comic book enthusiast and ICORD researcher Dr. E. Paul Zehr has created a cottage industry using superheroes to share science. Now, after prior books on Batman, Iron Man, and Batgirl, he uses Marvel’s Captain America — an ordinary man turned into an extraordinary hero, thanks to a military science experiment — as an entry-point to this brave new world of science, no longer limited to the realm of fiction. A Principal Investigator with ICORD, a BC-based world-leading centre for spinal cord injury research and professor of Neuroscience and Kinesiology at the University of Victoria, Zehr has extended his earlier work and drawn on the popularity of superheroes and his work on spinal cord plasticity and rehabilitation to complete his superhero science trilogy with Chasing Captain America: How Advances in Science, Engineering, and Biotechnology Will Produce a Superhuman. With our ever-expanding scientific and technological prowess, human biological adaptability is now in our fallible human hands. Thanks to the convergence of biology, engineering, and technology, we can now alter our abilities through surgery, pharmaceutical enhancement, technological fusion, and genetic engineering. 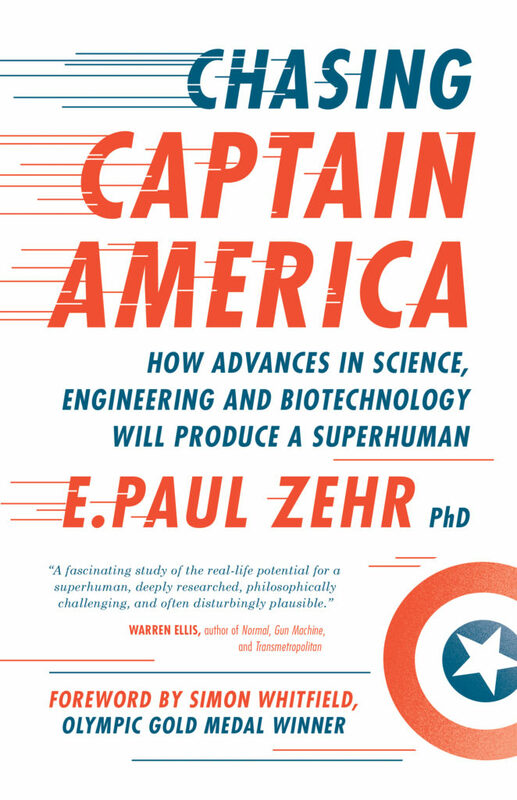 Released on April 11, Chasing Captain America explores these areas and more, asking what the real limits of being human are, how far we should bend those limits, and how we may be forced to reshape human biology if we are to colonize planets like Mars. Zehr’s latest explores the outer reaches of athletic achievement and zooms into space and fittingly includes a foreword by Olympic Champion Simon Whitfield and an afterword from NASA Astronaut Nicole Stott. At ICORD, Zehr explores the roles of sensation and spinal cord activity for rehabilitation of walking after injury. He includes examples of neuroplasticity and biomedical engineering in the context of an engaging non-fictional exploration of an iconic popular culture icon and one-time leader of the super team “Avengers”. Zehr previously used comic book superheroes to inspire the imagination around human potential in his 2008 Becoming Batman: The Possibility of a Superhero and 2011 Inventing Iron Man: The Possibility of a Human Machine. His 2014 foray into fiction hybrid, the tween novel Project Superhero, had an extra dimension for inspiration, as it included a major focus on female empowerment and role models. Intrigued? Pick up your own copy of Chasing Captain America online or at your local bookstore, and look for ICORD Director Dr. Wolfram Tetzlaff‘s blurb on the back cover!